Today we live in a brand new world. Every day we are bombarded with technological innovations that we never thought could exist, most of the time we did not even think we might need them. The truth is that just as we find this fascinating, so do our children. It’s amazing how we see babies open their eyes when they see a smartphone! And they know how to pass the images as if they were nothing. The other day I went to dinner at some friends’ house, and their almost two-year-old was watching video clips of a cartoon on youtube, through the tv. Suddenly the music ends, and another episode begins. When we look at it, the new episode is loading on the television screen, he had managed to “Skip add”, how is it possible? He can’t even read. It is almost surreal to think of this, the rapid growth they make, how quickly they learn and how they absorb whatever behavior we model. Technology is one of the most fascinating phenomena we can study. It is a vast area with numerous variables and benefits and damaging factors like anything else in life. Many of us are concerned about the frequency with which infants, children, and young people are connected to the television, to mobile phones, or tablets. They are always connected to the light screens. This concern is normal, many studies show the positive and negative consequences of this use. However, in both cases, there is a fundamental condition for the results obtained – moderation. This is probably the biggest obstacle that parents face when we try to reduce the use of these devices at home. What is moderating? When is too much? What’s the limit? It is fundamental to ask these questions, but we want to help and we will leave some important tips to moderate the use of the devices and take advantage of the positive and evolutionary components of these devices and their use! Often we do not realize the number of screens that children need to use simultaneously. How many times is your son on his cell phone playing with the dolls on the TV? I bet it’s a frequent situation. I know many cases where parents complain about this phenomenon, cannot use their mobile phone but also can not watch television. Talk to your children and negotiate what they intend to use, one screen at a time. Preferably use one and do another activity before returning to the lights. When we set behavioral rules at home, with children of any age, from infants to adolescents, it is essential to set an example. You can not ask them not to watch TV or not to be on the cell phone at the table if we do it. Obviously, I know that we are adults and we know how to manage our time, but the truth is that in most cases, children replicate our behavior. If we don’t lead by example, they find that the difference in rules is unfair and will behave inappropriately as a way of showing their displeasure. Setting boundaries is one of the most difficult things to accomplish at any stage of our lives. Whether for ourselves or for others, setting boundaries can lead to dissatisfaction for someone and this is not always well seen by us. Setting limits allows you to create a rule that should not be broken. Boundaries as well as rules, as they are rooted, create automatism, making the process easier and easier to realize. 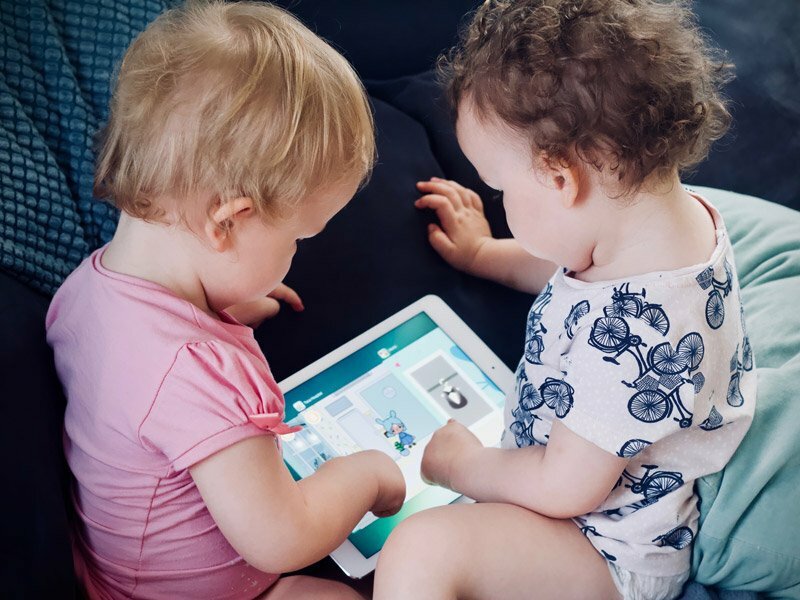 Opting to set a daily limit on the use of screens can be a useful tool to help with your child’s emotional regulation, manage family plans, and establish more inclusive, empathic, and strong relationships at home. Besides moderating the use of technology, it is also crucial to teach children and young people how they can and should use these technologies. Learn what applications are useful, make known the dangers of technologies and the internet use with the family to optimize family time. Technology can be a great ally to teach important things and behaviors to your child, it is necessary to take advantage of these strengths for your benefit and your child. The following is an excellent activity to do with your children. Help your child choose a game, ask what they are playing, how it works, how it is played. Initially, he will probably distrust, but deep down, he will enjoy seeing your interest in his things. He will enjoy receiving that attention and feeling that you attach importance to the things he does. If you choose this approach, you will notice that it will be easier to ask your child to do another activity, to reach an agreement, to try more creative things – painting, drawing, sport, etc. In addition, it has the advantage of strengthening your relationship, promoting communication and developing trust between you two. Do not forget to communicate and do activities together leaving aside the screen. Go for walks, eat out of the house, go experience things together. These activities make the difference and are a great way to spend time as a family. Promote different, original and creative activities. Take a day off the phones and digital screens .. and enjoy what you do not usually do. I promise you, it will be unforgettable!